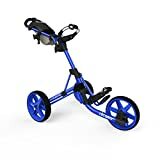 Golf push carts are a must for many novice as well as seasoned golfers, since they make it easy to get travel around the course with all the essentials. Golf push carts are not what they used be a decade or so ago, but today’s models come with several industry-leading features such as lightweight designs and generous storage spaces. When shopping for the best golf push carts, you will be spoilt for choice because there are just so many options to choose from. But after diligent research, we’ve narrowed down on 3 excellent options to ease your buying decision. 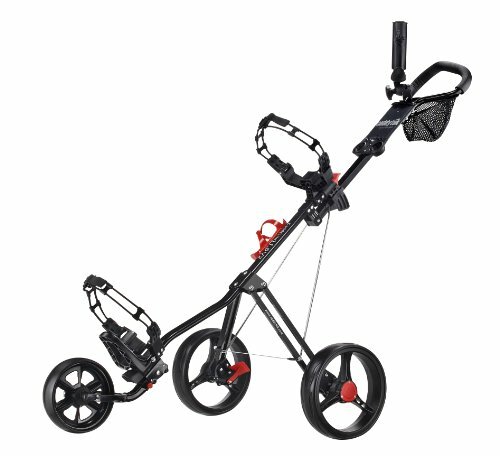 One look at the Clicgear Model 3.5+ Golf Push Cart, and you will know why it makes to the No. 1 position on this list. The cart not only features an eye-catching design, it boasts a lightweight footprint, and can be folded down with its easy to use slide-to-close mechanism. The cart measures 13" x 25" x 23" when folded down, and is crafted from aircraft-grade, scratch-resistant aluminum tubing. 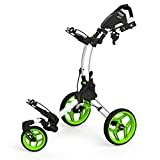 Further, it rides on three maintenance-free airless tires, and is equipped with an industry-leading handbrake system that minimizes cable wear, and prevents the cart from rolling off when parked. The Clicgear Model 3.5+ Golf Push Cart can be ordered in a choice of 8 great color combinations including Charcoal/Black, Charcoal/Lime, Charcoal/Orange, and tips the scales at just 18 lbs., making it a joy to haul around on the course. Additionally, the Clicgear golf push cart is fitted with easy-clip bag straps that can be adjusted to keep golf bags of all sizes secure. It is appointed with a large console for you to store essentials items and integrated ball, pencil and tee holders. But that’s not all as the bag even comes factory equipped with a flexible cup holder, umbrella mount, and durable storage net. Making this an ideal choice for both new and professional golfers. 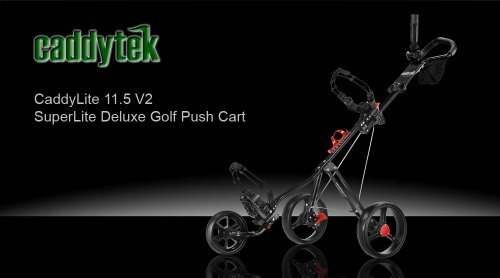 The CaddyTek SuperLite Deluxe Golf Push Cart boasts a lightweight footprint of just 12.2 lbs., allowing you to wheel it around easily on the course. Adding to this, it can be had in a choice of two color combinations – black and black/green and measures just 17.5” x 15.75” x 33.6” when folded. This golf push cart by CaddyTek showcases a widebody design, so you can push it with little effort. It's equipped with a simple and quick-braking system, which requires you to press to brake, and then again to release the foot brake. Adding to its list of key features is its patented bag holder design which can easily accommodate and secure your stand golf bag. Keep it secure while you focus on the game. In terms of convenience features, the SuperLite Deluxe Golf Push Cart by CaddyTek sets the gold standard with its onsite mesh net, beverage and umbrella holders. The bag comes with a 1-year warranty against manufacturer defect, so you can rest assured it will serve you well for several years to come, or be covered if something is wrong. 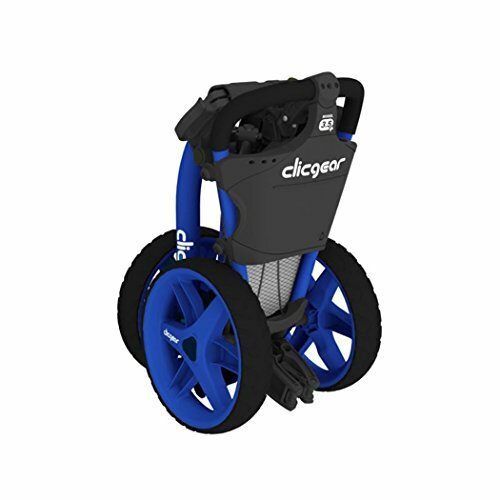 When it comes to golf push cart or other golf gear, Clicgear is a name that’s hard to beat, due to their superior quality of feature-rich products. 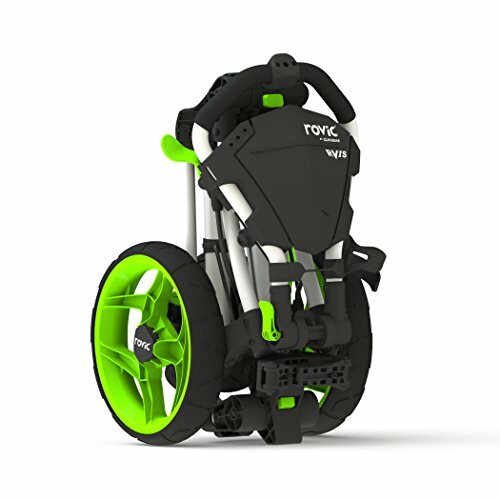 The Rovic RV1S Swivel Golf Push Cart is available in a choice of 5 color combinations including Arctic/Lime, Silver/Black and can be folded down to 13” x 15” x 24” for easy transportation and storage. The bag is made from robust-quality aluminum tubing, and rests comfortably on three maintenance-free airless tires. Speaking of wheels, the front wheel of the Rovic RV1S Swivel Golf Push Cart features a swivel design for excellent maneuverability. This wheel can also be locked in place with the foot-activated parking brake to prevent it from rolling off. The Rovic RV1S Swivel Golf Push Cart by Clicgear comes with a full-size console storage compartment, golf ball, pencil and tee holders and an integrated scorecard. For a golf push cart that won’t disappoint you on the course, the Clicgear Rovic RV1S Swivel Golf Push Cart is a great option to consider. If you’re an avid golfer you already know just how valuable golf push carts can be to your overall convenience on the course. The three golf push carts mentioned on this list are some of the best in their segment because they come with great features. Such as lightweight foldable design, bag holders, maintenance free airless tires and even class-leading braking system. All three carts are made from high-quality aluminum and rest sturdily on three wheels. The front wheel of the Clicgear Rovic RV1S Swivel Golf Push Cart features a swivel design, which allows you to maneuver it easily around the course. The CaddyTek SuperLite Deluxe Golf Push Cart features a patented push to brake and release hand brake system. While the Clicgear Model 3.5+ Golf Push Cart is not too far behind with an easily adjustable front wheel alignment system and handle mounted brake.